Rim with a view. The backdrop of a geologic mystery dwarfs a small tribe of homo sapiens. 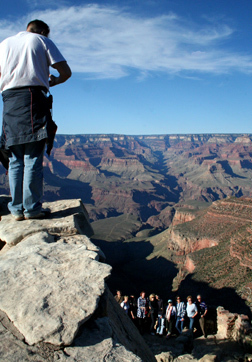 Hike from the Sierras to the Grand Canyon? Right. To begin with, I couldn't negotiate my way out Yosemite Valley on the 4-mile trail, let alone hoof it across the entire range, navigate hundreds of miles of chaparral to the southeast and then climb 7,000 feet to the South Rim. I have no doubt that a 12-year-old could do it with a GPS unit and a donkey. Me? Not a chance. Regardless, the title of this post evidently got your attention. 277 miles long, a mile deep and 8-10 miles wide, the Grand Canyon is maybe the most coveted view by astronauts in space - or so one of them claims in an interview. After all, it's the only rock formation above water that runs so steep, long and narrow. And while there's much debate about how this enigmatic topography got here in the first place, ask any of the 300 rangers assigned to the park and they'll tell you the beauty of the canyon lies in its unprecedented depiction of geologic time. But how long a time has it been, really? Now and then. At left above, the Bright Angel Fault. It's similar to the San Andreas, with its plates running laterally past each other, though with far less seismic intensity. That's the North Rim visible at the back. 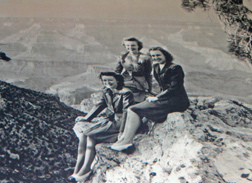 In the photo to the left, three of the famous "Harvey Girls", workers at a Grand Canyon resort started by Fred Harvey over a half century ago. Well, the goings on here during prehistory remain a subject of debate, but most geologists today subscribe to the DUDE theory. 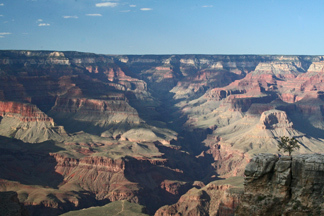 That is, the canyon began with Deposition of sediments atop a sea that separated the North American continent. (Plenty of sea shells to be found in those top layers, they say.) Later, tectonic forces caused the entire Colorado Plateau to Uplift high above sea level in one uniform chunk. (This development is rare, puzzling, and as yet unexplained.) Then five million years ago the Colorado River, because of its high elevation, succeeded in Downcutting a mile-deep gorge through the layers of rock. Time passed, and slowly wind and water Erosion slowly withered the rock away on either side of the river. 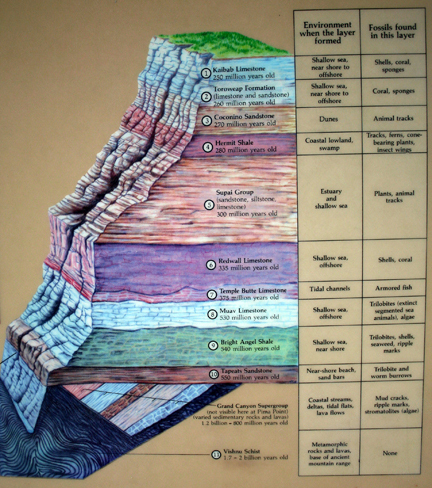 An illustration of Grand Canyon's different rock strata. Basically you find limestone, sandstone, shale (a.k.a. mudstone) and metamorphic rock at the bottom known as Vishnu Shist. No gold or silver here, but a little copper and lots of very pure uranium. Interesting about the coral and shells - not what you'd expect to find in the southwest U.S. Notice there's no mention of volcanic ash. Less popular is the theory that a massive wall of water carved the canyon in a single catclysmic event taking place not millions of years ago, but thousands. After all, you don't see any ash layers in the rock strata here. They should be there, since every 650,000 years or so there's a catastrophic eruption of the Yellowstone and Long Valley calderas. And before those calderas came into existence there were earlier ones in Idaho and New Mexico. Each of these supervolcanoes is thought to have sent millions of tons of pyroclastic debris ash blasting outward over a thousand miles. Did the ash simply get washed off the rock and sent downstream? No one really knows, but the latest research suggests flash floods churning down the river at the end of the last ice age (i.e. 13000 - 9000 B.C.) may be responsible for half the canyon's current depth. So if you're curious about the forensics of planet Earth, the Grand Canyon is a must-see. On the other hand, as the scene of so much apparent destruction, the park engenders none of the life-giving spirit of Yosemite. There's no comparison on that score. And while Yosemite requires at least two weeks of action-packed itinerary to fully absorb all that's there, you can spend two days in the canyon and never really need to go back. The extreme heat and cold here certainly doesn't augur a zest to return soon. Rangers delivering their daily yaks. 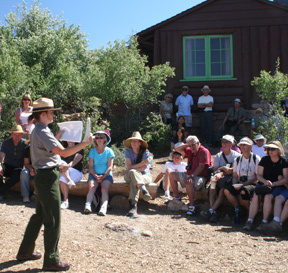 On the left, visitors to Yavapai Point get briefed on the flora, fauna and multiple climate zones in the park. On the left, a popular talk given behind Bright Angel Lodge recounts efforts to save the California Condor. The prehistoric bird has a wingspan of 9-10 feet and can often be spotted there soaring like a Boeing 737. 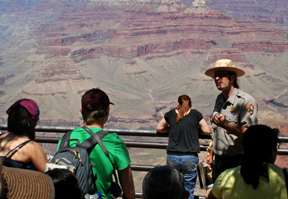 According to park rangers, many tourists also get pretty antsy when they roll up to Grand Canyon Village (the South Rim's version of Yosemite Valley) and can't see the Colorado River below. No worries, all you have to do is hop on the park's free shuttle and head due west or east for more stunning vistas. But give yourself plenty of time, because those busses get packed like sardines all the time -- even when I visited during the lull between spring break and summer.